Don't waste time searching through endless lists of houses for sale; have a new build designed and built exactly how you want it! For many Gillingham residents, having a new build is far more affordable and less stressful than looking to buy a house. So why not avoid the emotional and financial stresses that come with looking for a new home and have your new build built by the Trading Standards approved and highly skilled builders at Hebditch Property Renovations Ltd? Whatever style or size home you need, we'll design and built it exactly how you want it. 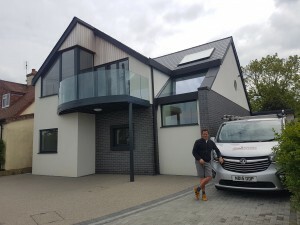 As one of Gillingham's leading new builds specialists, we bespoke design and tailor our new builds to suit all client requirements; providing everything from traditional 2 and 3 bedroom homes to modern and luxurious glass fronted domestic dwellings. As one of Gillingham's leading building and construction companies, we have the necessary skills and expertise to take care of absolutely every single aspect of a successful new build project. We will take care of everything from the planning permission and initial consultations and surveys through to the plumbing, groundwork, electrical installations and the completion of the new build itself. Whatever you need designed, built or constructed, we'll provide the ultimate new builds solution. Everything is backed by our 10 year build warranty too. For over two decades, we have developed a reputation for outstanding customer service, incredible build quality and first class building and construction services. So why not take advantage of our decades of expertise and experience and give our designers and Trading Standards approved builders the chance to demonstrate the quality of their workmanship with a unique and challenging new build? Hire Hebditch Property Renovations and you'll have your new build designed and built exactly how you want it! That means if you want a modern and stylish glass fronted home or a more traditional 2 or 3 bedroom home, we'll give you exactly that!